Let’s ignore his tweets and turn off TV. Let’s raise our flags, march in our local parades, relish loud, boisterous, patriotic music, eat burgers and hot dogs, play games, do a good deed, hug our neighbors and take joy in our children. Attributed to Ben Franklin, that phrase is ominous, especially in these times. The Founding Fathers had many qualms about the new, idealistic form of government they had just created. They would not be surprised at what is happening now. A leader who thinks he knows more than anyone, bowing to his lust for autocracy and just given more power by the Supreme Court. The diminution of minority rights. The discrimination against people because of their religion. A tax code undeniably skewed to the rich. A growing disparity between the haves and have nots. Fewer people making the effort to vote. The lack of civility. The disappearance of statesmanship. The burgeoning interest in moving to Canada. Democracy is the people governing through elected representatives. Are we losing it? Not necessarily. This country has not been a beacon of hope or a shining city on the hill for all people. Far, far from it. We enslaved people because of their skin color and then fought a horrible civil war, which still didn’t settle the issue of giving equality under the law to everyone. Ku Klux Klanners roamed the South. We put 100,000 American citizens in concentration camps for no legal reason, just because we feared they might side with Japan in World War II. Our children are not the world’s best cared for or the best educated. We no longer agree on what facts are. Supporters of Donald Trump believe what he says, even when it is proved that he has lied, thousands of times. Many defend his desire, thwarted by majority opinion and condemned by the international community, to separate parents and children at the southern border. Opponents of Donald Trump attribute the basest of characteristics to him and his supporters. Members of his staff are shamed in public. Americans see a president who is undisciplined and mocks, ridicules and venomously attacks anyone who disagrees with him. Americans see that the person who got the most votes did not win. People are discouraged at the scandals in every institution they believed in, from sports to religion. They see strides in protecting the environment wiped out by big business interests in collusion with government officials. And yet. Americans are volunteering to help others in record numbers. The outrage over babies pulled from the arms of their mothers caused the president to back down although the incompetence of the administration in not being able to reunite them is stunning. 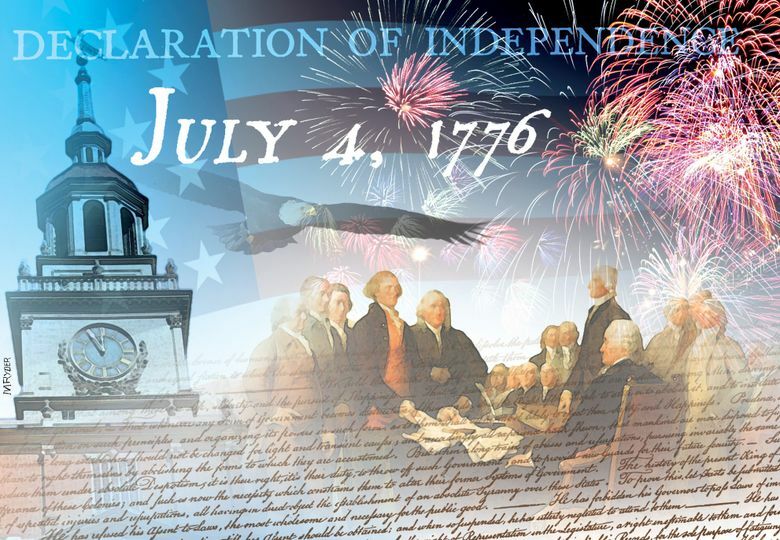 July Fourth is celebrated with as much enthusiasm, excitement and patriotic fervor as ever. The majority of Americans understand that “America First” may be a catchy slogan but is a self-defeating policy in a global world and that individualism must be tempered by the common good. Trump appeals to our worst instincts. He creates fear and hate and outrage. He is not a nice person, and you definitely don’t want your children acting like him. Corruption in his administration is growing like kudzu. Our closest allies think Trump is an imbecile. Our enemies are heartened. But Trump will go down as one of the worst presidents in U.S. history, maybe, in a hundred historian years or so, the worst. This is a man who’s going to have one heckuva lousy legacy. On July Fourth, let’s have a Trump-free day. Let’s ignore his tweets and turn off TV. Let’s raise our flags, march in our local parades, relish loud, boisterous, patriotic music, eat burgers and hot dogs, play games, do a good deed, hug our neighbors and take joy in our children. Let’s don’t mention his name. Let’s don’t even think about him. July 5th will come around soon enough.